RahulGandhi #DemandRafaleProbe while addressing on the floor of house . 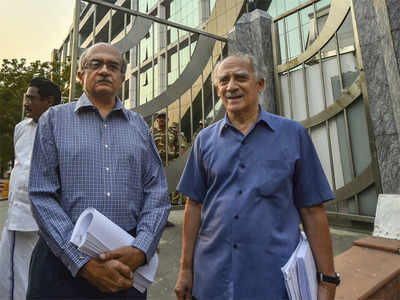 Yashwant Sinha and Arun Shourie, and advocate Prashant Bhushan on Wednesday moved the Supreme Court, seeking review of its December 14 verdict dismissing all PILs alleging irregularities in the procurement of 36 Rafale jets from France. In their review plea, they alleged that the judgment “relied upon patently incorrect claims made by the government in an unsigned note given in a sealed cover” to the apex court.They have also sought that the plea be heard in an open court. Apex court on December 14 last year dismissed the pleas challenging the deal between India and France for procurement of 36 jets, saying there was no occasion to “really doubt the decision making process” rejected the pleas seeking lodging of an FIR and the court-monitored probe alleging irregularities in the Rs 58,000 crore deal, in which both the countries have entered into an inter-governmental agreement. Centre had on December 15 last year filed an application in the top court seeking correction in a paragraph in its judgement on the Rafale deal in which a reference was made about the Comptroller and Auditor General report and Parliament’s Public Accounts Committee. In its judgment, Supreme court had noted that the pricing details have been shared with CAG, and the report of the CAG has been examined by the PAC. The issue of CAG and PAC was mentioned in paragraph 25 of the judgment of the top court which had held that there were no irregularities in the procurement of the jets from France. The judgment had said that the material placed before it shows that the Centre did not disclose in Parliament the pricing details of the Rafale fighter jet, but revealed it to the Comptroller and Auditor General.